← Creatine Monohydrate vs. Creatine Ethyl Ester: Settling the Score! Moreover, right on the bottle it mentions, “5 novel creatine analogs,” which simply means, creatine equivalents, more or less. Now, this is supposed to persuade the consumer that this product is better than other pre-workout supplements which contain boring old plain creatine monohydrate, because the analogs are better used by the body and will help you get bigger. However, there has been little research done on these newer creatine forms whereas creatine monohydrate has been proven time and time again to be an effective ergogenic aid (see article below). However, given the flashy label, awesome adjectives, and muscular bodybuilders who are endorsed by the company, who could resist such an appealing product?? As are most things, a dietary product is only as good as what’s inside, and sadly enough, this product is nothing but a way to produce expensive urine. If you’re shelling out $36+ for this crap, I feel sorry for you. To the left, I’ve provided a nice screen shot of this product’s “novel” ingredients. The rest of the label is much, much longer. 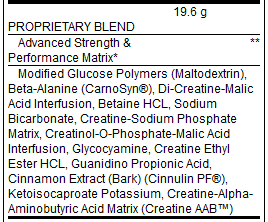 As you can see, the “Proprietary Blend,” which is just a fancy way of saying, “a bunch of stuff thrown together,” is made up of Di-Creatine-Malic Acid, Creatine-Sodium Phosphate, Creatinol-O-Phosphate-Malic Acid, Creatine Ethyl Ester HCl, and Creatine-Alpha-Aminobutyric Acid (Creatine AAB). We’ve already discussed CEE in depth, so I won’t bore you to death with that again, however the rest of these creatine analogs do deserve some scientific scrutiny, and that’s exactly what I’m going to do. Below is essentially the same little chart I showed yesterday but altered to include the ingredients listed in the product above (except Creatinol-O-Phosphate). Again, the chart shows different creatine forms and their respective % of creatine in relation to creatine monohydrate . So far, looking at the chart, it looks like EACH AND EVERY ONE of the creatine analogs contains LESS creatine than regular old creatine monohydrate. Already this product looks like a scam, however let’s continue, because, even though they may have less creatine per unit, they might be more bioavailable… although I doubt that’s the case. In my last article I talked a lot about solubility, stability, and bioavailability and how CM differed from CEE in those respects. Like I said, I am not going to bore you with CEE again (we know it is crap), but I will touch upon the other creatine analogs briefly. If you haven’t read my previous article, I suggest doing so now. Essentially each one of the creatine analogs is a creatine salt (except Creatinol-O-Phosphate), meaning that it is a creatine molecule with an acid attached. This basically allows the creatine to become more soluble by lowering the pH of the liquid. If you remember from yesterday, creatine is more soluble in warmer water or liquids with a lower pH. The solubility factor goes to the creatine salts (except Creatinol-O-Phosphate); however we know how to easily correct this for CM without the added costs. To reiterate yesterday’s comments; the lower the pH of the liquid, the greater the extent of creatine’s degradation (in addition to solubility) to creatinine. One might accurately say that this is irrelevant because we’re not leaving the solution sitting around long enough to allow the creatine salts to degrade. However, the stomach environment is acidic and these newer forms of creatine are less stable than monohydrate in acidic environments  and could definitely degrade to creatinine before they even reach circulation (CEE definitely does). To date there are no studies comparing these (specific) newer creatine analogs to CM, however, these analogs do contain less creatine than CM and it can be assumed that given their reduced stability in the stomach, they would offer no benefit over regular CM. There is one study I’m aware of that does compare creatine monohydrate to an effervescent creatine (tricreatine citrate) abbreviated TCC, on total body creatine retention . 16 males were assigned to consume either a placebo (dextrose), creatine monohydrate, CM + dextrose, or TCC + dextrose supplement. It turns out that the CM + dextrose group had the highest levels of creatine retention (muscle stores), retaining about 80% of the ingested supplement. The regular creatine monohydrate without dextrose and the TCC + dextrose retained about 61 and 63% creatine, respectively, meaning, that even with the added dextrose, TCC was no better than CM alone, but was inferior to CM + dextrose. In addition, TCC contains about 66% creatine, which is more than more the creatine analogs contain within NO Xplode. Although hard to generalize, it can be assumed that these salts add no additional benefit over CM either. More research is needed to make definitive conclusions, however. So you may have noticed that so far I haven’t really mentioned COP. Well, it is for the fact that I pretty much grouped all the other creatine compounds together, and COP doesn’t really match up with them. COP is less soluble than CM; that much I did point out. However, there was evidence back in the late 70’s that COP could be a precursor to creatine within the body due to increased levels of creatinine in the urine of patients taking COP . The creatine, however, just degrades to creatinine through normal processes and probably does not contribute to creatine stores. In other words, they’re trying to sell you on a cool name rather than definitive research. Again, it all comes down to what people will buy. If you put enough flashy adjectives on a bottle and get a huge muscular IFBB pro to endorse your product then you can pretty much watch the cash flow in. This product comes from one of the bigger supplement companies out there, so I am positive there are plenty of people consuming this pre-workout supplement. Please, do yourself a favor and buy something that’s actually been shown to work. Too easily we get caught up in the flashy advertisement and can’t see past (or through) the BS. And for what, an extra rep at the gym you could have easily gotten if you focused more on your diet and training protocol than buying the newest and enhanced pre-workout formula? I’ll leave it at that. 1. Jager R, Purpura M, Shao A, Inoue T, Kreider RB. Analysis of the efficacy, safety, and regulatory status of novel forms of creatine. Amino Acids 2011;40:1369-1383. 2. Greenwood M, Kreider RB, Earnest C, Rasmussen C, Almada A. Differences in creatine retention among three nutritional formulations of oral creatine supplements. J Exerc Physiol 2003;Online 6:37-43. 3. Melloni GF, Minoja GM, Lureti GF, Merlo L, Pamparana F, Brusoni B. Acute clinical tolerance of creatinol-O-phosphate. Arzneimittelforschung 1979;29(9A):1477-1479.